County Tree Service was established in 1979 in the town of Tewksbury, MA by Joseph Falcione. 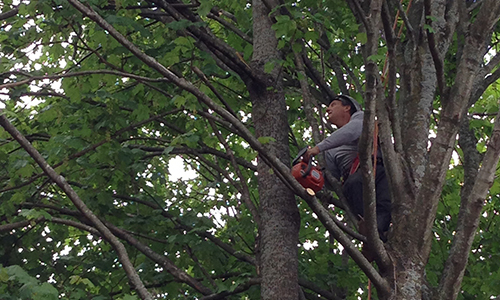 Joe started working in the tree care industry when he was sixteen years old in the town of Bedford, MA. After working in the private sector, he joined the Reading Forestry Department. His time working for experienced tree service companies and the forestry department gave Joe experience in an era of tree work when craftsmanship was king. From these "old-timers" he learned the art of pruning, or tree trimming, the right way to remove a tree, and the proper way to grind stumps. His skill set and commitment to excellence is why he still provides tree care for some of his very first customers. We employ a Massachusetts Certified Arborist on staff at County Tree. In 1987 County Tree Service moved to North Reading, MA, where it still operates to this day. CTS services Andover, Bedford, Concord, Lexington, Lynnfield, Middleton, North Andover, North Reading, Reading, Tewksbury, and Wilmington. If your town is not listed, still feel free to call if County Tree Service is the company that can meet your tree care needs. As a tree care company we specialize in tree pruning, low-impact tree removal, stump grinding, tree planting, and tree cabling. The only service we do not offer is spraying. It is our mission at County Tree service to offer the highest quality tree pruning and tree removal in tree care industry while respecting the integrity of your property. Our goal is to leave your property looking better than when we arrived. © County Tree Service. All rights reserved.